This blog is a venue for me to share my views on the most likely future state of business, productivity, competition and the technologies that will power the successful. The concept of a blog did not exist when I started my first company Onyx Software in 1994. It was a constant challenge to outline all my thoughts on the future state of CRM, and outline the how's and why's. We were routinely to market 2 years ahead of other vendors in major phase shifts in the CRM landscape (a combined Sales-Marketing-Service product in 1994, Web Access in 1996, Hosted CRM in 1998, Web-Services Architecture in 2000,...), but did not benefit commensurately in the 'awareness' category as we were dependent on analysts and others like the Gartner Group to catch up vision-wise and write about us. Not so for Smartsheet, which I founded with Maria, John and Eric in 2005. In these pages I'll detail my vision, our solutions, customer successes, lots of 'how to', and hopefully provide some very useful content for people to use in bettering their own businesses. Most importantly, I'll attempt to demonstrate this blog's headline by using Smartsheet's awesome Work Management Platform to orchestrate the world's resources and do work for you readers. I'll spend a few minutes a day generating lists you can't find or can't afford. You'll be amazed at how much productivity is left to be wrung out of the global economy with just two key things: visionary technologies like Smartsheet and those select few individuals that are the 'get it done' people within their teams around the world. I grew up blessed with the world's best parents on a wheat and cattle ranch in what I actively promote as the "Center of the Universe" - Grangeville, Idaho. To date my deepest domain knowledge is still agriculture, and the satisfaction of the visible and tangible results of a long hard day are still unbeaten by any other work experience. I learned leadership and common sense from my father who leads by example and always does the hardest jobs himself. And, I've learned about people from my mother, who should be the heroine in a 'how to manual' on parenting. I've found my calling in solving hard problems with lots of moving parts My wife asks me why I always have to pick the toughest categories in business to throw my body against, and to be candid, I can't seem to stop myself. Fortunately, or unfortunately, depending on the boom and bust cycles, technology and software is where I've landed. For almost 20 years, I've been building software with great people and delivering real value to all kinds of customers. To date, my proudest accomplishments in business are the relationships with colleagues and customers. I believe we are all better off for having known and worked with each other. "Brent Frei is the executive chairman and co-founder of Smartsheet.com, an online work management software company. 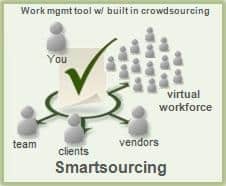 The company’s mission is to manage the world’s work by enabling anyone to work seamlessly across teams of people they know, as well as get work done from people they don’t know via Crowdsourcing and OnDemand Workers. Notably, Brent was the CEO of Onyx Software Corp., a Bellevue-based customer relationship management (CRM) software company he co-founded in 1994. In his 10 years as Onyx CEO, Brent oversaw the generation of $600 million in direct revenue. During his tenure, Onyx received a consistent top 5 ranking amongst CRM vendors worldwide, and the number one ranking for customer satisfaction by independent customer satisfaction surveys. He was recognized and credited for his pioneering work in the field of CRM software and services, including in 2001, at the age of 33, the Smithsonian Institute recognized Brent as a "Pioneer in Technology." Ernst and Young named him a 1997 “Entrepreneur of the Year.” In 2001, he was the sole recipient of Dartmouth College's Thayer School of Engineering Fletcher Award for lifetime achievement – the youngest recipient ever selected for this award. Brent’s past roles include: executive vice president of Intellectual Ventures, programmer analyst with Microsoft Corporation and a mechanical engineer at Motorola Corporation. Brent received his bachelor's degree in engineering from Dartmouth's Thayer School of Engineering, and his BA in engineering sciences from Dartmouth College."